Debbie Ocean (Sandra Bullock) gathers a crew to pull off the impossible, stealing a $150 million necklace from around actress Daphne Kluger’s (Anne Hathaway) neck at New York City’s Met Gala. 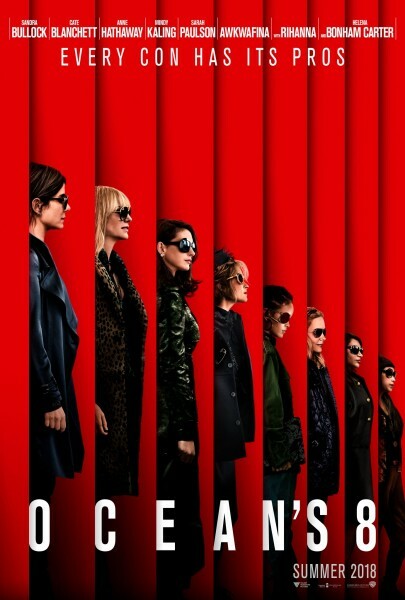 Ocean’s 8 is a spin-off from the George Clooney-starring Ocean’s movies from the 2000’s. Besides from a small cameo near the beginning of the film, which is a nice touch rather than feeling desperate, Ocean’s 8 is its own thing and stands on its own merit. There’s something immensely satisfying watching women who are good at what they do, go and get the job done. There’s all the usual types of characters when it comes to a heist film. Lou (Cate Blanchett) is Debbie’s right-hand woman, Tammy (Sarah Paulson), is a fence, Rose (Helena Bonham Carter) is the one who has to stick close to their target, Amita (Mindy Kaling) is the forger, Nine Ball (Rihanna) is the hacker, and Constance (Awkwafina) is a pick-pocket. They are all so great in their roles and the chemistry between them all is wonderful too. I have to say Hathaway is the standout when it comes to the cast’s performances. She’s the epitome of a diva here, funny, outlandish and deceptively smart too. The heist itself is clever and manages to fool the target and the audience though Ocean’s 8 lacks the style seen in previous Ocean’s movies. That being said, the costumes more than make up for that – all these women look fabulous. The soundtrack is also pretty great too. Ocean’s 8 is an entertaining heist film with characters you root for. I really hope there’s a sequel because I’d love to see these women steal more amazing and priceless stuff. 4/5. Working for crime boss Doc (Kevin Spacey) as a getaway driver, Baby (Ansel Elgort) is the best in business, that is until he meets waitress Debora (Lily James) and wants to get out of the whole shady business altogether. Baby Driver is a fun film. I thought it was fine but I did not love it. In part I feel that’s because I’ve come to realise I’m just not a huge Edgar Wright fan, I’ve never hated any of his films but they never really leave a lasting impression and I do not love them like so many other people seem to. I feel Baby Driver can be summed up by two things – the car chases and the soundtrack. 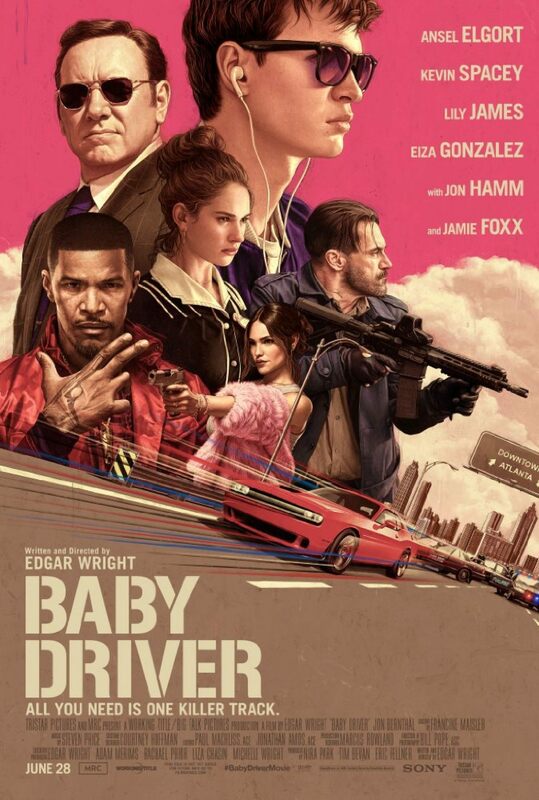 The car chase sequences are thrilling and exhilarating and I liked how they always showed off Baby’s skills in different ways. 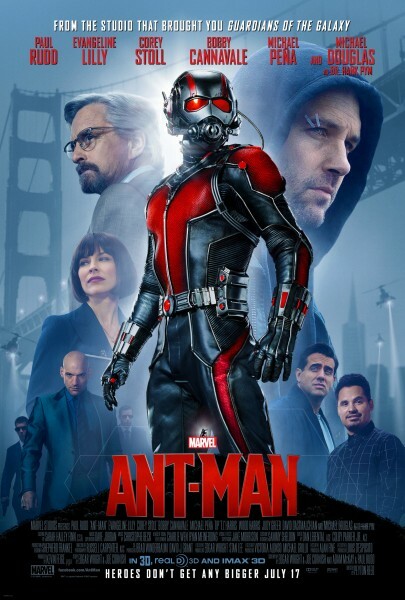 The soundtrack is full of catchy, recognisable songs and I did like how the film used the soundtrack (and sound in general) however having a film that constantly had a backing song was a bit grating at times. Baby has tinnitus, meaning he constantly has a ringing in his ears, and he uses music to block it out. It was the way the film showed how Baby heard sounds, like how it got quieter when he took an earbud out so it was like you were in his shoes throughout the film, that I really liked. The whip fast editing that went with the music was cool too. Baby Driver felt like style over substance to me. This is a film about a getaway driver so naturally there’s heists (one of my favourite things in any type of story ever) but I found myself no really being engaged with it. I think this was down to the characters. All the cast did a fine job but I didn’t get attached to or particularly like any of the characters except for Baby’s foster dad Joseph (CJ Jones). Baby Driver is a sharp, fast-paced film. 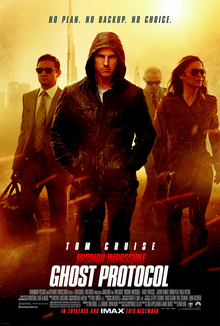 It’s full of action and thrills but it lacks that final punch of something great for me. 3/5. When the principle of Dennington Prep is arrested for embezzling school funds, his son Jason (Alex Saxon) hatches a plan with three other students to do the impossible and steal from the U.S. Mint in order to save their school. 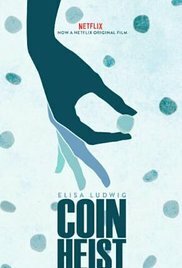 Coin Heist is a heist film (the title gives it away) but it still has some high school and family drama in it that instead of taking away from the main story, it enriches it. The four unlikely friends who come up with this plan on paper look very much like the usual high school stereotypes, but through good performances and a well-written script, the film slowly shows that they are all more than the reductive labels put on them by the genre. Benny (Jay Walker) is the footballer whose scholarship goes down the drain when the schools’ funds disappear, Dakota (Sasha Pieterse) is the grade A student who would really rather perform, Jason is often seen as a slacker but he turns out to think quick on his feet, and Alice (Alexis G. Zall) is the hacker who doesn’t want people to see her vulnerability. They are all more than their stereotypes and seeing how their relationship grows is a pleasant surprise. Coin Heist also has a brilliant soundtrack. It’s almost reminiscent of the 80’s teen movies sometimes, it has some techno tracks and indie music that all fits with the story so incredibly well. Coin Heist is a fun film, with a solid cast of characters committing a clever heist that you don’t tend to see in the genre. 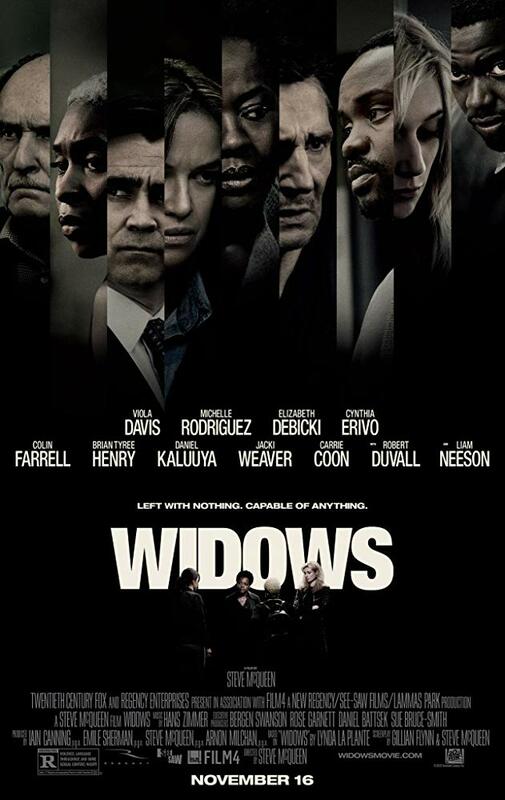 It might be a smaller scale heist but it’s no less fun and still has the usual twists and turns seen in the genre. 4/5. 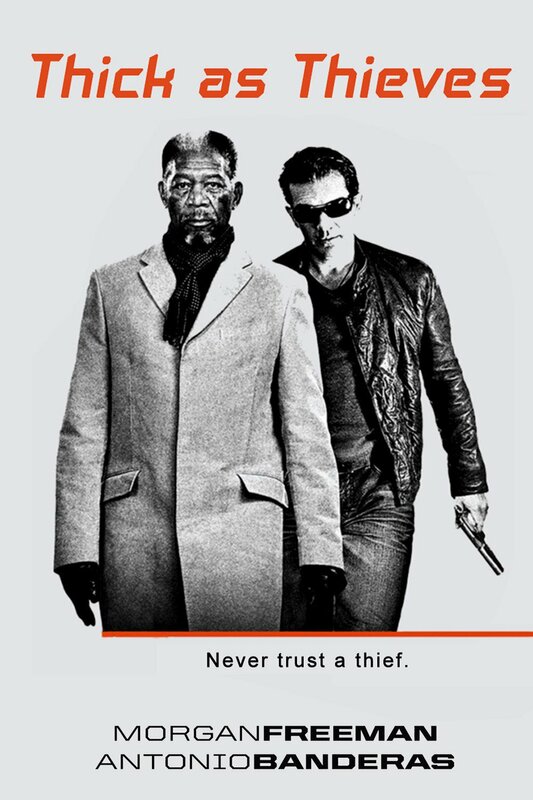 Veteran art thief Keith Ripley (Morgan Freeman) recruits younger crook Gabriel Martin (Antonio Banderas) to help him pull of one final job and steal two Fabergé eggs to pay off the Russian mob. Thick as Thieves is heist film that aims for big things but doesn’t quite manage it. The heist itself is offers some interesting action pieces, especially the bit with laser-sensors, but the set up and big-reveal is overly-complicated. Instead of being satisfied with the double-crosses and the big reveal, you are left more bemused by the whole thing. As well as the heist itself, Ripley and Martin also have to deal with the local police force led by Lieutenant Webber (Robert Forster) and the FBI breathing down their necks. It is a race against time and a game of cat and mouse that slowly reveals there’s more players than you’d expect on the board. Some of the reveals you’ll see coming while others are more of a surprise, that being said while the direction is good the script does feel a bit convoluted at times. The highlight of Thick as Thieves really is Morgan Freeman and his chemistry with Antonio Banderas. Whenever Freeman is on screen you’re instantly focused on him and he’s just as charming as Banderas. Unfortunately their presence isn’t enough to make it anything but a mediocre heist film. If you’re a fan of the genre you might want to check it out as it does have some fun moments but it’s nothing really new. 3/5.